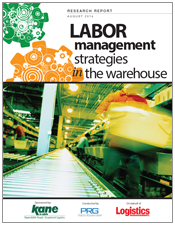 KANE teamed up with top supply chain researchers, Peerless Research Group, to survey logistics executives on the strategies they employed for warehouse labor management. The results of that research are summarized in this report. Questions explored a range of workforce management issues, including use of technology, strategies to drive productivity, and use of third-party labor providers. The report, filled with charts and other data, allows you to compare your approach with your peers.